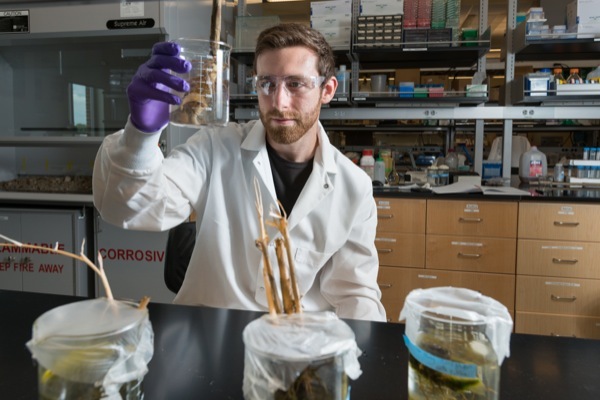 3:49 p.m., July 7, 2014--Matthew Fischel, a doctoral student at the University of Delaware, is busy this summer researching the ability of wetland plants to sequester heavy metal contaminants in the face of sea level rise at a community near Wilmington. Fischel, whose hometown is Hockessin, Delaware, aspires to become a professor in the natural sciences, following in the footsteps of his adviser, Donald Sparks, S. Hallock du Pont Chair in Plant and Soil Sciences and director of the Delaware Environmental Institute. “I want to be able to shape the future in environmental research and help train the next generation of scientists,” Fischel says. He’s well on his way, as one of five UD students who have won prestigious Graduate Research Fellowship Program awards from the National Science Foundation (NSF). The oldest graduate fellowship of its kind, now in its 62nd year, the program has a strong track record of selecting recipients who achieve high levels of success in their future academic and professional careers, with past fellows including numerous Nobel Prize winners and other leading innovators and educators. NSF Fellows benefit from a three-year annual stipend of $32,000 along with a $12,000 cost of education allowance for tuition and fees (paid to the institution), opportunities for international research and professional development, and the freedom to conduct their own research at any accredited U.S. institution of graduate education they choose. Fischel, both honored and excited to be selected for the national award, says the fellowship provides the flexibility he needs to conduct research he’s interested in and which will help improve the natural world. Five UD alumni received honorable mention. They included Christine Gregg (Honors), currently a graduate student in mechanical engineering at the University of California-Berkeley; Douglas Kenny, a graduate student in chemistry at UD; Kelsey Lucca (Honors), a graduate student in developmental psychology at Duke University; Joshua Martin, a graduate student in materials science and engineering at Northeastern University; and Sarah Solomon (Honors), whose field of study is psychology-cognitive neuroscience.